In the beginning, many would be fly fisherman struggle with casting because they fail to understand a few basic principles that are the foundations of good casting. This failure often results in complete frustration as the newcomer endeavours to come to grips with the art of fly casting. Often, an enthusiastic beginning rapidly diminishes to a point where the fly rod is relegated to a secluded garage corner where it gathers dust. Another aspect is that once “bad casting habits” become ingrained they are harder to correct. A sound understanding of these fundamentals will make it much easier to identify problems, what causes them and what to do to correct any faults. Before discussing the fundamentals, the first thing a beginner needs to understand is that it is approximately the first 30 feet of the fly line (called the “head”) that provides the weight to load the rod (that is, it causes the rod to bend during the casting process). This can be equated to a sinker in normal bait fishing or a lure in spin casting. Look on the fly line as a long thin sinker. 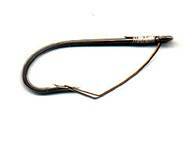 Having a short amount of fly line out of the rod tip is like using a light sinker. This will not load the rod as much so only a short distance will be achieved. When the optimum length of fly line (about 30 feet) is out of the rod tip, there is a greater weight, consequently the rod is loaded more and this translates to greater distances. 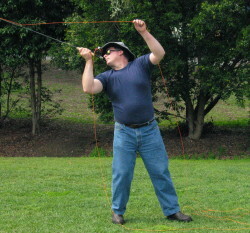 The ultimate aim of a good cast is to have the fly line form a narrow “U” or “V” shaped loop as it unrolls and straightens towards the intended target. The upper and lower portions of the loop, “the legs”, should be parallel and opposite each other. This shape is desirable for accuracy and a smaller and tighter loop has less surface area and decreases wind resistance therefore travels further. Before the rod will load all the slack line must be removed. 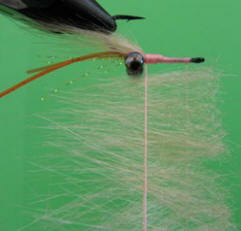 The rod tip will only start to bend (load) when you are able to move the end of the fly line. 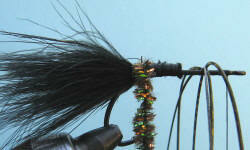 Begin each cast with the fly line in a straight line from the rod tip to the fly. If there is slack, some portion of the casting stroke is wasted before the slack is taken up and the rod begins to load. Slack can also be present during the cast. For example, the fly line needs to be straight behind the rod tip as the forward cast starts. The weight to be cast, that is the fly line, provides resistance against the forward movement of the rod only when it has fully straightened behind the tip. A “loose or large loop” caused by an incorrect stroke and a short pause provides little or no resistance. The line with just some slack causes wasted movement of the fly rod taking up the slack before the rod starts to load. In effect, the casting stroke is shortened and therefore less power is applied to the cast. Because the fly line is pulled behind the rod tip, it follows the path “traced” by the rod tip. Therefore the fly line will only follow a straight line to the target if the path traced by the rod tip is the same straight line. The rod is only an extension of your hand/arm to provide a mechanical advantage. To take a simplistic look at the casting stroke – if you move your hand in a straight line then the rod tip will move in a straight line. If the rod tip pulls the line forward in a curving path (caused by moving the hand in a wind screen wiper motion) the line will follow that same wide curving or convex path. This wide type of loop has little power and is very wind resistant consequently it will not travel very far. 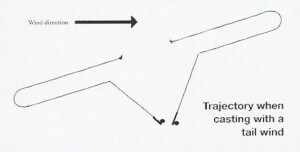 If path of the rod tip traces an upward curve (concave path), a closed or tailing loop (line crosses and fly catches on line or tangles) will result. 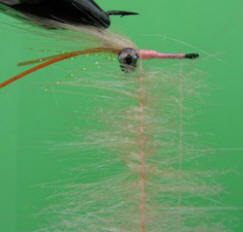 The tailing loop in many instances will prevent a full turnover and layout of the fly. This also frequently leads to the dreaded “wind knot” in the leader. The rod tip not only needs to move in a straight path in the horizontal plane but also in the vertical plane. If the path of the rod tip swings out to the left or right, the top leg “swings out” to the left or right of the bottom leg of the loop. In some instances this casting fault can be deliberately utilised to swing the fly around behind obstacles. Here is a way to help visualise a straight line path, its relationship to hand movement and how it is achieved. Take the top half of a rod and stand near the end wall of a room and hold the tip of the rod at the point where the ceiling joins the wall. Stand close enough so that your elbow is slightly bent. Move your hand backwards and forwards with the rod tip maintaining constant contact with the point where wall and ceiling join. You will note that irrelevant of how long you make the stroke, your hand will follow a relatively straight path (half a rod distance from the ceiling) and the elbow and arm move up and down to accommodate for the changes in distance. It is imperative to remember that the path that the rod tip takes is the path that the fly line will follow. 3. 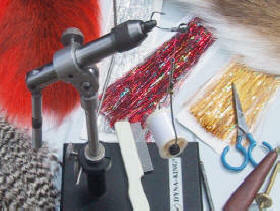 Applying acceleration to the fly rod. Casting is not a matter of strength but rather an application of power through the technique used. The aim of casting to move the fly line from stationery and then propel it in such a way that it travels to the intended target. 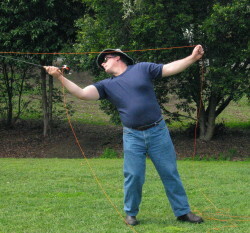 This is achieved by moving the rod so that it loads or bends against the resistance of the weight of the fly line. An efficient cast accelerates the rod slowly at first and continues to smoothly increase in speed until the rod reaches the end of the casting stroke where an abrupt stop is performed. The majority of acceleration takes place near the end of the stroke. 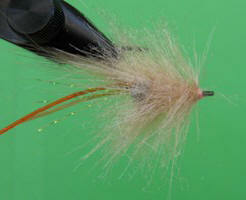 A jerky acceleration action will cause shock waves in the fly line and in the worst case, tangles. The rod tip pulls the fly line along behind it throughout this acceleration. A flyline itself has no tendency to move in a straight line but will follow the path traced by the rod tip as long as it continues to accelerate. The rod will continue to bend (load) only as long as the hand is moving with increasing speed. 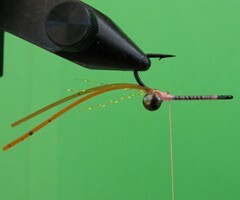 Stopping the rod at the end of the casting stroke causes the rod to straighten (unload). This propels the fly line forward and forms the casting loop. The more abrupt the hand stops, the faster the rod will unload resulting in the transfer of more energy to the flyline and hence a longer cast. The rod tip also needs to be stopped as close as possible to the straight path being followed. A controlled abrupt stop of the rod tip as close as possible to this path sets up an anchor point for the fly line that then accelerates close over the top of the rod. This translates into a narrow loop. Stopping the tip further below the straight line path translates to a wider loop. As a general rule, small casting strokes are for short casts and wide casting strokes are for long casts. The wide casting stroke could be as far as the casting arm can reach while the shortest cast could only involve a slight wrist movement. It is important to match the size of the casting stroke to the length of line being cast. For example, if a lot of power is applied over a short casting stroke in an endeavour to throw a long length of line, the effect is to cause the rod tip to dip causing a concave tip path. This leads to a tangled line or tailing loop. The pause between the forward and backcast allows the loop to straighten before beginning the next stroke. Remember, the line has to be straight in the air for it to load the rod. If the loop has not completely unrolled and line is not straight, the rod will not load until the slack is taken up. Consequently the effective length of the casting stroke is shortened taking up this slack. On the other hand, as soon as the line straightens, gravity takes effect and the line begins to fall towards the ground. 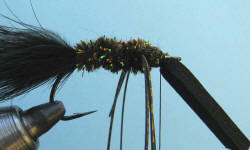 Pausing too long means that the fly will snag on undergrowth or “stick” on the water. The shorter the line, the shorter the pause, longer the line, the longer the pause. Getting the right timing for the length of pause is a crucial for good fly casting. The best way to develop this sense of timing is to turn your head and watch the loop unroll. 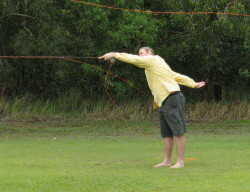 Remember that you can’t start the cast until you can move the end of the fly line so it is important that fly line is straight with no “slack”. Start with the rod tip low and with your casting hand in front of your body, elbow slightly forward of the body and the forearm parallel to the ground. To perform the back cast, keeping a firm wrist, draw the hand back in a straight line and stop with the rod pointed up at about slightly less than a 90 degree angle to the ground behind you. This will have the effect of throwing the line up and back so that it unrolls in the air. 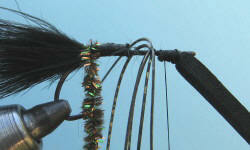 As you perform this action the rod is loaded (bent or flexed) by the weight of the fly line trailing behind the tip. 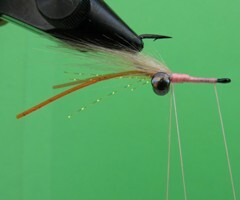 When the rearward movement of the rod is stopped the rod unflexes and propels the following fly line and the casting loop is formed. 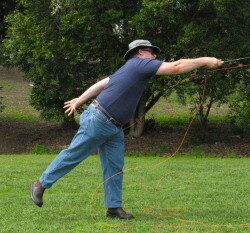 If the rod movement is stopped with the rod lower to the ground at the rear, this will have the effect of throwing the line into the ground as the rod unflexes. It is important that stop be performed as quickly as possible. The more abrupt the stop, the more power is transferred to the casting loop. 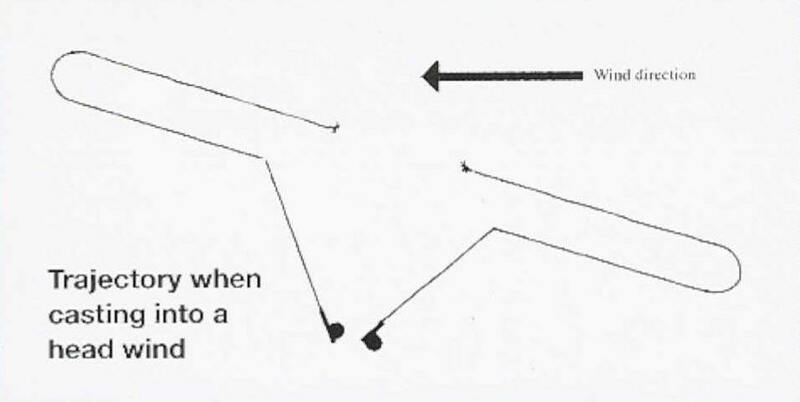 If the hand movement is executed by more of a rotation rather than a draw back in straight line, this has the effect of moving the rod tip in a semicircular path that results is the formation of a open or wide loop that has little power. Before the forward cast can be commenced, the casting action has to pause momentarily to allow the loop to completely unroll and the line to straighten. The hand should remain stationary during the pause. The more line that is in the air the longer the pause has to be. The forward cast should be commenced at the instant that the line straightens. This is performed by moving the hand forward smoothly in a punching or throwing motion and stopping the rod sharply with the rod at about 60 degrees to the ground. To form a desirable small loop, the rod tip needs to travel in a straight line which means that the hand must move in a straight line. If the hand is moved in a semicircular action, a wide or open loop will result causing a lack of power. As well as the tip traveling in a straight line, the rod must also travel in the same plane throughout the casting stroke. This means that if the rod is angled at say 45 degrees to the body, that angle should be maintained on the back cast and the forward cast. If the angle is changed, it will cause the end of the fly line to swing around. For short casts that only require a small casting arc keep your hand about as high as your ear. Longer casts with a larger casting arc require an extension of your hand and arm both up and out from your shoulder. The line hand should always follow the movement of the casting hand at a consistent distance. 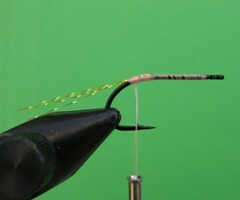 An open loop leaves you without enough leverage on the rod to make a decent forward cast. This is caused by the rod tip moving downward when the rod straightens. (Most often this is due to the caster bending the wrist or moving the rod in a windscreen wiper action thus giving a curved rod tip path. Remember that the rod is really only an extension of the hand. Concentrate on moving your hand in a straight line and performing a quick stop with the rod tip pointed upwards (at about 45 degrees to the ground). The quickest way to remedy this fault is to watch your backcast. This happens when there is a fault with the stopping of your backcast. 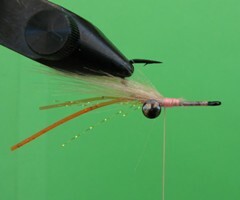 The common cause is the lack of a quick stop to throw the loop back or letting the rod tip drop too far after the stop. This is really a combination of problems 1 and 2. The reason the line hits the water is because you are throwing it that way. If the rod tip is moving down when it is stopped at the completion of the backcast then the line will go down and hit the water. Concentrate on moving the rod tip backwards in a straight line. Perform the stop with the rod tip pointed upwards so that the line is thrown back rather than down. 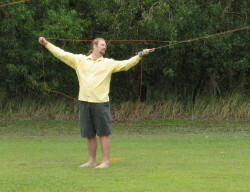 The cause is having slack line before the acceleration phase of the cast. Vibrations are sent down the line when the moving rod tip is suddenly put under pressure by coming up tight against the weight of the line once the slack is taken up. 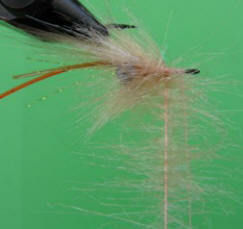 This causes the tip to bend and recoil sending waving effect down the fly line. It may also be caused by gripping the rod too tightly. The cure is to start the cast with the rod tip on the water and making sure there is no slack between the fly and the tip. Loosen your grip on the rod so that it is just sufficient to stop it rotating in your hand. Squeeze when you perform the stop and them relax the grip again. Problem 5 – Line lands in a pile and doesn’t lay out on completion of the forward cast. The most probable cause is that the rod didn’t have enough load or bend to throw the amount of line trying to be cast. The line simply runs out of energy to straighten out completely and falls in a heap. 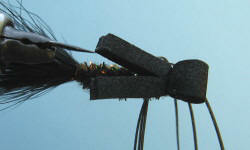 Large flies and poppers can also add to the problem because of the greater resistance in the air. The problem can be solved by increasing the hand speed during the acceleration phase of the casting stroke and ensuring that the stop at the end is abrupt so that all the energy stored in the loaded rod is transferred to the moving fly line. There is one common casting error that leads to tailing loops and it is called “creep”. At the end of each movement of the cast particularly the backcast it is important that the rod remains where it is stopped and not moved forward during the pause. It is preferable to allow the rod to drift back. 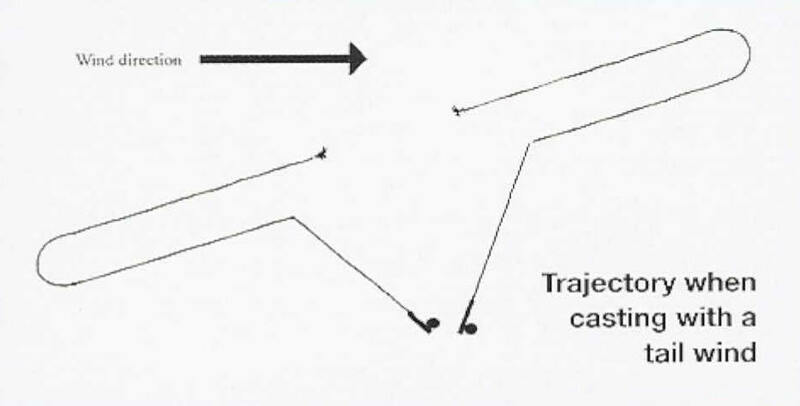 If the caster “creeps” the rod forward in preparation for the forward cast while waiting for the line to straighten, the stroke for the next cast is shortened. When the same amount of power is applied with a shortened stroke it causes the rod tip to dip giving a concave rod tip path. The line will follow the path traced by the rod tip and consequently the line will cross itself hence a tailing loop results. Concentrate on keeping the rod stationary (imagine it hits a wall with super glue on it) during the pause while waiting for the line to straighten. After the stop and the definite pause while the line straightens, commence the forward stroke with a smooth application of power, gradually accelerating until the stop on the forward cast. 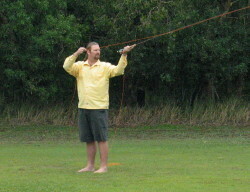 Wind knots are a common problem for many casters. They probably got the name because someone noticed that they occurred more often on windy days. The wind or absence of it has little or nothing to do with the problem. To make a good loop it is necessary for the rod tip to travel in a straight line. To enable this, the size of the casting arc must be matched to the amount of power applied. If too little power is applied in relation to the arc, the tip will travel in a convex path and large loops will result. If too much power is applied over a small arc then the concave path that results causes tailing loops. So where does wind come into the picture? Most casters realize that they have to throw harder to overcome the effect of the wind. However, if more power is applied to the same casting arc that is used to cast in calm conditions then the result is usually an over loaded rod. 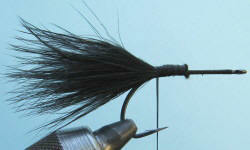 This causes the rod tip to dip causing the tailing loops and knots. Increase the length of the stroke to accommodate the additional power applied. It is very important to keep the tip traveling in a straight line so a long stroke is required to allow a smooth and gradual application of the power required to overcome the wind.